The latest release from our friends at Cranium is Australian band Sh'mantra's debut CD. The music, though difficult to define, is a great mix of psychedelia, raw jam rock, metal, and progressive rock. The band consists of Matt Seldon on bass, Thorin Kerr on keyboards and vocals, Alex Hole on guitar, Shane Wedesweiller on guitar, and Michael Lenton drums. 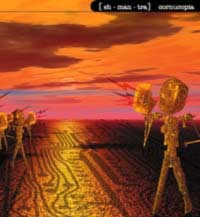 The very cool cover painting depicts an apocalyptic world with what looks like robots sporting bullhorns on a terrain that seems to be a microchip. Smokestacks billow in the background. I think this is a concept work and a voice during the first track says something about radiation fallout. The 10 minute opening track, "Recurring Nocturnal Habit" is an overture piece building up very slowly and features some cool, though not flashy, metal sounding guitar. "Shipwreckers", one of my favorite tracks, is an extended jamming piece that gets downright psychedelic jazzy. One guitar and the rhythm section maintain the jazz feel while the other guitar wails away in an all too brief freakout. "Spawn Of Tamagotchi" is a raw, jamming metallic piece that perfectly fits the dark world depicted in the cover painting. Sh'mantra excels at creating adventurous heavy rock that focuses more on telling a story and creating aural landscapes than being flashy, which is what this style of music typically is. The music is primarily instrumental, though there are some voiceovers and some dissonant vocals on "A'extent Dawn" that sound like Robert Wyatt (though the music certainly doesn't). I really like how this track alternates between light music during the vocal sections and bursts of doomy metal. There's some good guitar work with one guitar providing a psychedelic metallic crunch and the other playing a simple, but disturbing melody line. The rest of the disc follows these themes and I loved the distinct, but cooperative contributions from the twin guitars. In summary, Sh'mantra plays heavy, but melodic rock that should appeal to spacerockers, and fans of heavy psych and prog. You can visit Sh'mantra at the Cranium Music site. The band also maintains their own Sh'mantra web site.